Democratic presidential candidates have a strong economic message: Their anti–Wall Street message poses a big challenge for Republicans. As a tactic, it’s moral, pragmatic, and smart. Republicans better have an answer. Democratic presidential candidates Jim Webb, Bernie Sanders, Hillary Clinton, Martin O’Malley, and Lincoln Chafee take part in a presidential debate in Las Vegas, Oct. 13, 2015. Tuesday night’s Democratic presidential debate revealed much more than the state of the horse race. It didn’t just pit Hillary Clinton against Sen. Bernie Sanders, or affect Vice President Joe Biden’s decision about running, or introduce the other candidates. It framed the whole election. Democrats are putting together a case for jerking the leash on capitalism. It’s moral, pragmatic, and smart. It fits the spirit of the times. Republicans had better come up with an answer. Traditionally, Republicans win elections by running against big government. This year’s crop of Democrats seems a prime target, with a self-described socialist, Sanders, surging to the front of the pack. But it’s not that simple. Early in Tuesday’s debate, the moderator, CNN’s Anderson Cooper, asked Sanders how a socialist could win the general election. And yet, an hour later, Cooper demanded to know why Sanders had voted against the Wall Street bailout. By that measure, Sanders is a purer capitalist than most Senate Republicans. That’s a good summary of the Democrats’ economic platform for 2016. Here are the details. 1. Respect moral boundaries. Republicans like to accuse Democrats of opposing free enterprise and morality. 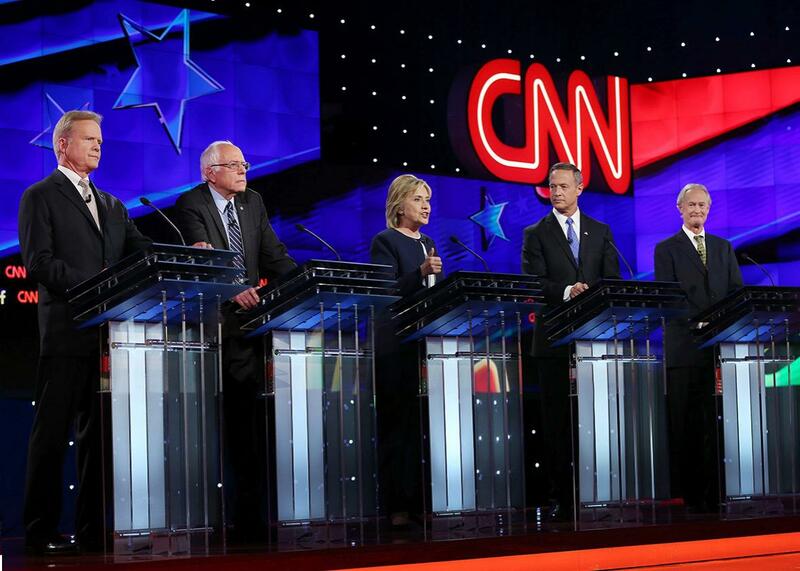 But in this debate, the Democratic candidates spoke of morality as a check on capitalism. “What democratic socialism is about,” Sanders declared, is “that it is immoral and wrong that the top one-tenth of 1 percent in this country … own almost as much wealth as the bottom 90 percent.” Sanders invoked Pope Francis, asserting that “we have a moral responsibility to transform our energy system away from fossil fuel … and leave this planet a habitable planet for our children and our grandchildren.” The candidates also demanded other restraints on capitalism: a higher minimum wage, equal pay for women, and paid family and medical leave. 2. Measure the economy by welfare, not growth. Republicans say free-market policies produce economic growth. In the debate, the Democrats argued that this method of judging the economy, through aggregate statistics, is inadequate. “You can have all of the growth that you want,” said Sanders, “and it doesn’t mean anything if all of the new income and wealth is going to the top 1 percent.” Clinton, Sanders, and Martin O’Malley, the former governor of Maryland, focused instead on stagnant middle-class incomes. They accused trade agreements of failing to raise wages or create good jobs in the United States. You can question their conclusions. But their standard of evaluation—looking at the distribution of wealth and income, not just the amount—is intuitively sound. 3. Disrupt concentrations of power. Republicans see big government as the main threat to freedom. Democrats see a different threat: big business. O’Malley warned that six banks now control 65 percent of the U.S. gross domestic product. Jim Webb, the former Virginia senator, said Wall Street now manages 55 percent of the world’s capital. That degree of concentration creates several perils. One problem, articulated by Sanders, Clinton, and O’Malley, is that the biggest financial giants become too big to fail and should therefore be broken up. Another concern, raised by Sanders, is that communications companies acquire so much information about us that they rival the government as a threat to privacy. Sanders distinguished the evils of “corporate America” from our “great entrepreneurial nation.” That’s a common view on the American left: big business bad, small business good. 5. Protect Main Street from Wall Street. The candidates distinguished “Main Street”—small, local companies that produce real goods or services—from “Wall Street” giants that buy or sell wagers on what will happen in the real economy. O’Malley and Sanders, playing on the debate’s Las Vegas locale, accused the financial industry of “casino” capitalism. Three times, Clinton chastised Wall Street firms for “speculative behavior.” The candidates agreed that banks shouldn’t be allowed to engage in “recklessness” that exposed the public to high risk of economic contagion and a taxpayer-funded bailout. That’s the Democrats’ argument for 2016. Are they right? Personally, I’m more in line with the one Democratic candidate who didn’t join in these attacks: former Rhode Island Gov. Lincoln Chafee. Chafee, a longtime liberal Republican, left the GOP when the right wing took over. I like his penny pinching, and I’m skeptical of the promises I heard from the other Democrats: free college for everyone, more Social Security, and subsidized health care and higher education, even for undocumented immigrants. That’s way too much spending to take on. But the Democrats’ critique of capitalism? Basically, they’ve nailed it.